Rachel Grey is a hit or miss author for me. She has written some books that are two stars for me, and others that are an easy five stars. She has the ability to nail a good romantic comedy, and The Allure of Julian Lefrey was a HIT for me. There was nothing over the top about this story. It’s truly about a girl, Josephine who moves from a small town to New York City and is trying to make it in the blogging/fashion world. 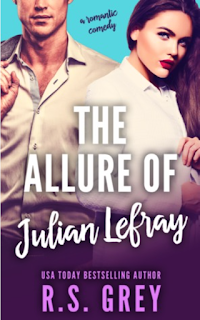 When she lands an executive assistant position to the charming Julian Lefray, her life gets all screwy. Josephine or Jo for short doesn’t have time for the alluring Julian, the problem is Julian has the time for Jo. As a result, you get this whole story of a guy chasing the girl, in a perfect masculine, funny, and charming way. As Jo navigates the waters of New York city, which for her consists of no money, and a small apartment she has to figure out if she can let Julian fit into her life. The book isn’t a cat and mouse game between Jo and Julian. It’s truly nothing like that, it’s two people who form this witty relationship and are trying to see how they belong with each other. This is one of Rachel Grey’s books that you won’t want to miss!